The father of the accused ISIS supporter who allegedly planned to commit an armed attack at a bar in Rochester on New Year's Eve told NBC New York that his son is mentally ill and tried to commit suicide on several occasions, including just this past summer. Omar Lutchman also said his son isn't the terrorist that he has been made out to be by federal authorities and that they suspect the FBI entrapped him into plotting a terror attack. 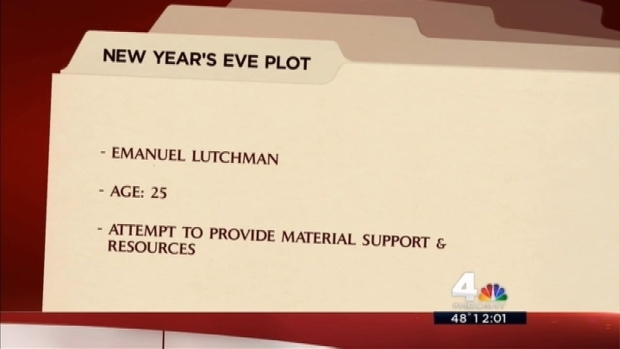 "He has mental issues and he's been having mental issues for a long time," Lutchman told NBC New York in an exclusive interview about his son, Emanuel Lutchman. Lutchman's father said that what his son needed was to be committed, but instead investigators planted the seed of the attack in his head. He said he doesn't know if his son would have gone through with it. Authorities have arrested an alleged ISIS supporter who allegedly planned to commit an armed attack at a bar in Rochester on New Year's Eve on behalf of the terror group, officials said Thursday. Jonathan Dienst reports. Federal authorities say the 25-year-old Lutchman sought to prove he was worthy of joining the Islamic State group by carrying out a New Year's Eve attack at the Merchants Grill using a machete and knives provided by an FBI informant. He allegedly planned to kill and behead people at the bar. He was arrested Wednesday. Lutchman's lawyer, Steven Slawinski, declined to comment on the charges. The owner of the bar and grill, John Page, told the Democrat and Chronicle of Rochester that Lutchman was a panhandler who "caused more trouble than positive." Authorities did not identify the bar, but Page said his restaurant was the supposed target. The U.S. attorney's office for western New York did not return a phone call Friday seeking confirmation of Lutchman's intended target. Details of Lutchman provided by his family and those who knew him paint a portrait of a deeply troubled man who joined gangs and was in and out of prison. He has a wife and 2-year-old child, but his father said he's not sure if they're still together. Lutchman, who was raised a Christian, may have converted to Islam in prison for protection, his father said. "He was a Blood, then he was a Crip, now he's a Muslim," his father said. The alleged ISIS sympathizer was also suicidal, according to his father. A sentiment his grandmother, Beverley Carridice, shared. She told NBC News that he has been plagued by psychiatric problems since childhood and that he stabbed himself in the stomach during a suicide attempt. She also said that he had been prescribed unspecified psychiatric drugs but was not taking them when she last saw him in August. His arrest is the latest example of what researchers see as a major undercurrent in the cases of other young men who wanted to join ISIS: many have histories of mental illness and criminal behavior. At least 10 of the 70 people charged with wanting to help ISIS over the last 20 months have criminal records and “more than a handful” have been diagnosed with mental illness and been treated with psychotropic drugs,” according to Karen Greenberg, the director of Fordham University’s Center on National Security. He was described in court papers as having long criminal history including a 2006 robbery conviction that led to a five-year prison sentence. Lutchman's former stepmother, Charma Lutchman, told the Democrat and Chronicle that Lutchman spent part of his childhood living with his grandparents in New York City. She said that while young, he was struck by a car, an accident that transformed him from a happy-go-lucky boy to a more withdrawn child. "He wasn't the same boy I knew after he got hit by a car," she said. "He was different, more quiet." The newspaper reports Lutchman spent four months in a Rochester jail in 2015 on misdemeanor charges of petit larceny and menacing his girlfriend. Lutchman was scheduled to appear in state court on Jan. 11 on the domestic violence charges. It's likely that date will be postponed. Meanwhile, his father says that he and the rest of Lutchman’s family are in shock and had no idea someone so close was allegedly planning a terror attack.